The Xcel Series has a case drain facility that improves resistance to pressure spikes and extends seal and motor life. Eaton's XL2 and XL4 motors share a three-zone design allowing bi-directional operation and a case drain facility that improves resistance to pressure spikes and extends seal and motor life. 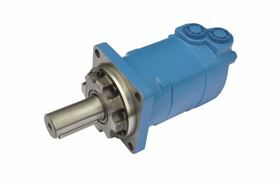 Many applications demand a mix of higher and lower rated motors for different functions. This means either having multiple suppliers or compromising price or performance of motors from one supplier. Complementing the Char-Lynn premium line, Xcel can be applied to the lower to medium duty functions, with one single supplier for all levels of motor performance. Eaton`s Xcel series disc valve high torque low speed motors offer options for shafts, ports, mounts and displacements to simplify and shorten the design process. XL2 motors have the option for integral valves, offering a space and weight saving alternative to separate manifolds. Dual threaded and manifold ports are also offered for flexibility.